Ron Iafrate’s passion for cooking began at home helping his Italian mother cook old family recipes. As his love for food grew, he combined these early experiences with the diverse culinary traditions of the northeast. Ron received a degree from and has continued his education by earning further certifications in Nutrition, Management and Sanitation. He has served on the board at the Louisiana Technical College System helping to devise curricula to train new chefs. 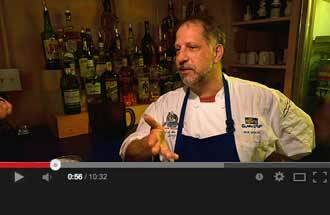 Chef’s cooking talent took a new direction when he worked under renowned Chef Fred Faria who introduced him to the delights of Cajun cooking and music in Acadia, Rhode Island. With industry experience in fine dining restaurants and chain hospitality operations throughout the country he has earned many impressive awards including being named 2010 Chef of the Year by his peers at the American Culinary Federation. In early 2012, Ron followed his dream and opened Ron’s Gumbo Stop & Pub. Ron personally oversees all food purchases and insists on using only the freshest locally grown ingredients. Because of this the specials change with the seasons, but the award winning gumbo is always available. Open Tuesday - Saturday from 11 am - 9 pm.